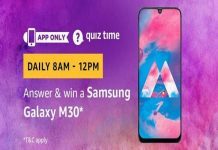 Amazon App Quiz Time | Answer and Win iPhone 8. Answers all the 5 Questions Correctly & If you are lucky then you will win brand new Win iPhone 8. This is Amazon App only contest. 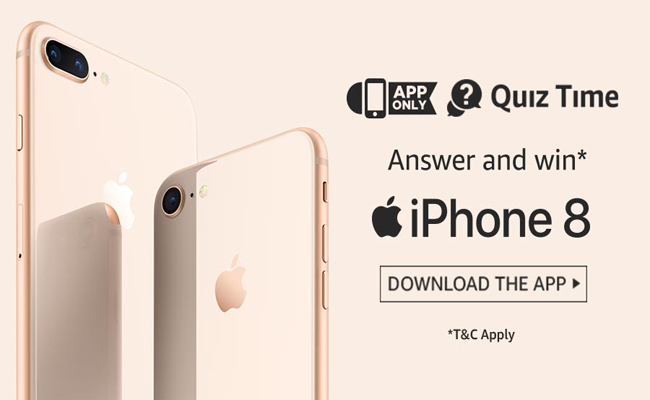 Note: You need to answer all 5 questions correctly for eligible to win iPhone 8. 1. Which processor does the iPhone 8 run on? 2. Which of these features is available on the iPhone 8? 3. The iPhone 8 will be available in __GB and 256 GB capacities. Fill in the blanks. 4. What is Apple’s intelligent voice assistant called? 5. The iPhone 8 will NOT be available in which of these colors? 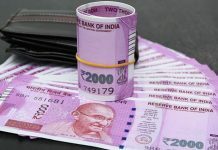 The draw of lots will be carried out during the Contest Period for the questions and a total of 2 (Two) participants will be selected as winners by a random draw of lots. A total of 2 (two) participants will be selected as winners of the Contest. The declared winner(s) will be eligible for winning an Apple iPhone 8 32GB each (hereinafter referred to as “Prize(s)”). 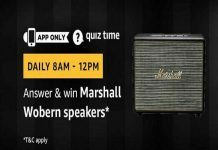 This Quiz Time Contest (“Contest”) is brought to you by Amazon Seller Services Private Limited (“ASSPL”/”Amazon”). Please read these terms and conditions (“T&Cs”) before entering the Contest. You agree that, by participating in this Contest, you will be bound by these T&Cs and you acknowledge that you satisfy all Contest eligibility requirements as provided herein below. These T&Cs are in addition to the Amazon.in Conditions of Use to which you agree by using www.amazon.in and its mobile/tablet application or mobile site thereof (collectively hereinafter referred to as “Amazon.in”). To the extent the Amazon.in Conditions of Use are inconsistent with these T&Cs; these T&Cs will prevail with respect to the Contest only.